For weeks Democratic lawmakers on Capitol Hill have expressed frustration about what they view as President Obama‘s tendency to easily compromise with congressional Republicans during critical negotiations. But in the days before and after the president’s release of the American Jobs Act, and his proposal unveiled on Monday to reduce the federal deficit and pay for his jobs plan, Obama has taken a decidedly tougher stance. In Rose Garden remarks delivered Monday morning, the president unveiled a plan that calls for an expiration of tax cuts for the wealthy–vowing to veto any bill that does not raise revenues and would place a greater burden on middle class and low income Americans than it would on the nation’s top earners. His plan would raise $800 billion in revenues by allowing the Bush tax cuts to expire for the nation’s top earners, $700 billion from closing “wastefulâ€ tax loopholes and $1.1 trillion from ending the wars in Iraq and Afghanistan. The plan also calls for $248 billion in savings from Medicare, 90% of which would come from reducing overpayments to providers, and $72 billion in Medicaid savings. In his remarks, the president mocked House Speaker John Boehner‘s speech before the Economic Club in Washington last week, where Boehner stated that tax increases are not an option. Obama lauded Boehner for saying Washington lawmakers cannot take a “my way or the highwayâ€ approach to reducing the deficit and growing the economy, adding that’s exactly the approach Boehner was advocating and it was neither smart nor right. Not all Democrats fully support the president’s plan, however. Reps. Keith Ellison and Raul Grijalva, who co-chair the Congressional Progressive Caucus, expressed concern that Obama’s proposal would increase costs for Americans who depend on entitlement programs. 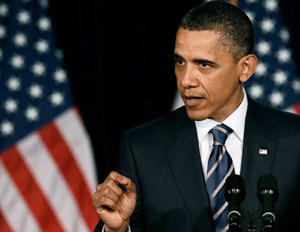 Congressional Black Caucus Chairman Emanuel Cleaver praised the plan.